The top photo is my mom and my sister as a baby. 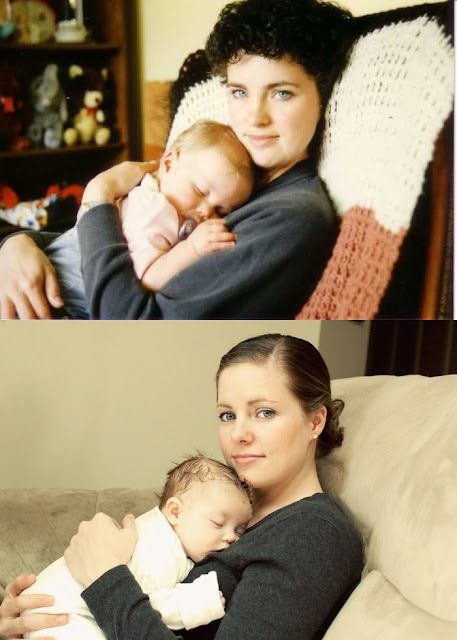 When my sister had her baby girl a few months ago she decided to recreate it. Isn't it beautiful? I keep going back to look at it. That is so sweet! I loved it the first time I saw it and I love it now. i saw it on nikki's blog.....love it. This is a priceless and perfect memory! You are very thoughtful and I could see this being treasured for many generations to come. What a perfect moment. It's lovely to see how the generations keep going. And that baby, "it's so squishy I could die!" OMG Your sister looks just like your mother in that photo! What a great family "tradition"! Thanks for hsaring! ♥ Your mom is so beautiful...and it doesn't look like an old photo! I love the one of your sister, too...very cool. Thanks for sharing! I've never been able to see the family resemblance between you and your sister, until I saw this picture. I can see both of you in your mother. I love the recreation of the photo! Thanks for doing that!! It's by far my most popular pin on Pinterest but a lot of them no longer go back to my blog or don't go back to this post. I'm impressed you bothered!